The best part of any imposter tale is the how-to: the step-by-step of how to get a fake I.D., and then how to parlay that I.D. into access, followed by money. Steven Spielberg’s Catch Me If You Can tells the true story of Frank Abagnale (played by Leonardo DiCaprio), who in the early ’60s posed as a pilot, a doctor, and a lawyer in order to lend legitimacy to his check-forging schemes. The movie moves as fast as its protagonist, enjoying the “confidence” part of the con game, and how a mere kid is able to use what he’s learned from episodes of Dr. Kildare and Perry Mason to project an air of authority. “People only know what you tell them,” DiCaprio says to the FBI agent pursuing him (played by Tom Hanks), by way of explaining how he was able to fool so many people, just by saying the right words in the right order. Spielberg and screenwriter Jeff Nathanson distill that idea into one perfect image: DiCaprio singing along with Mitch Miller while sitting on the couch with the rich Louisiana family of his fiancée, Amy Adams. Spielberg and Nathanson go a little overboard with the why of Frank Abagnale, tying his restless fakery to a broken home and an emotionally distant father, played by Christopher Walken. 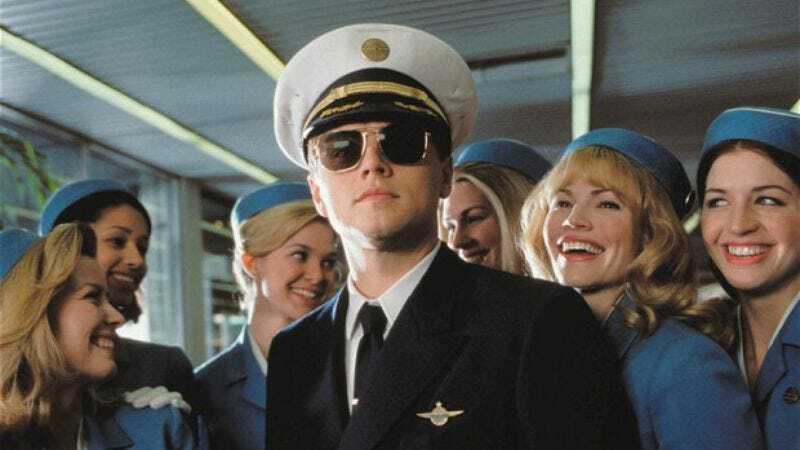 But Catch Me If You Can excels at putting Abagnale’s adventures into context, showing an America obsessed with the trappings of material success, which seem so abundant that it doesn’t seem wrong for a boy who has none to help himself. The movie doesn’t really judge its hero for it, either. Though Hanks’ lawman is admirably dogged, when Catch Me If You Can intercuts Hanks washing clothes in a Laundromat and DiCaprio sleeping with a thousand-dollar-a-night call girl (played by Jennifer Garner), there’s no mistaking which guy the audience should want to be. Availability: Catch Me If You Can is available on DVD and Blu-ray from Paramount, and for streaming rental and download from multiple outlets.